This is yet another sign of the apostasy of Brian McLaren. In this piece on Brian’s site, he praises an atheist for saying nice things about him, who thinks Brian is the epitome of Christian faith. Why would an atheist praise Brian McLaren? Well, the answer is easy enough, because Brian is essentially saying the same thing as the atheist, and their goals line up. Atheist and heretics are not offended by Brian’s message, they are brothers traveling the same road. They see Brian as moving into their camp bringing presents (the young and foolish). The early Church dealt with a similar problem. The religions of the ancient Roman world were all accepted as equally tolerable and equally valuable, and to a large number equally vain, to the Roman people. All the gods were worshiped, and the bond of unity was maintained because every god reigned with equal favor and benefits. It was the Jews first, then the Christians, who violated this universe of unity, by declaring absolutely that there was no other God, but God. Why were the ancient Christians persecuted? They separated themselves from the world and were accused of being divisive. They accepted as wrong, and idolatrous, every form of religion but the one Christ established. They refused to bow to the Roman leaders and throw a little incense on a Pagan altar, or burn a candle to their gods. They were labeled as “atheist” because they did not believe in the other gods as equal means of salvation. They gave honor to One Who was higher than the Monarch. And, there was one other reason for persecution, it was because of the teaching of the Judas Zealots. Christianity provided the Zealots with a way to defeat the government; they were revolutionary Jews who hated Roman rule, and Christianity was simply a means to an end. They were nationalistic, and earthly minded. Christ has nothing to do with those who don’t believe in Him, they are the world. Next Brian will be telling us that unbelievers are pleasing to God; Oh! beg my pardon, he already says that. Brian McLaren has defected from Christ and Christianity, while still wearing the uniform and using the language (although with new definitions), and is one of the new Judas Zealots now trying to use Christ to their own advantage. 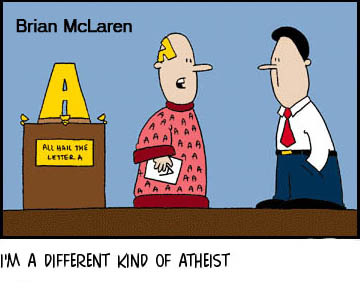 This is the reason that he is pleased to now add to his ranks, an atheist. It matters not that they represent two different worlds and systems, it only matter that he accomplish “his” goals, of unification of all beliefs, government reform, and selling a few books.